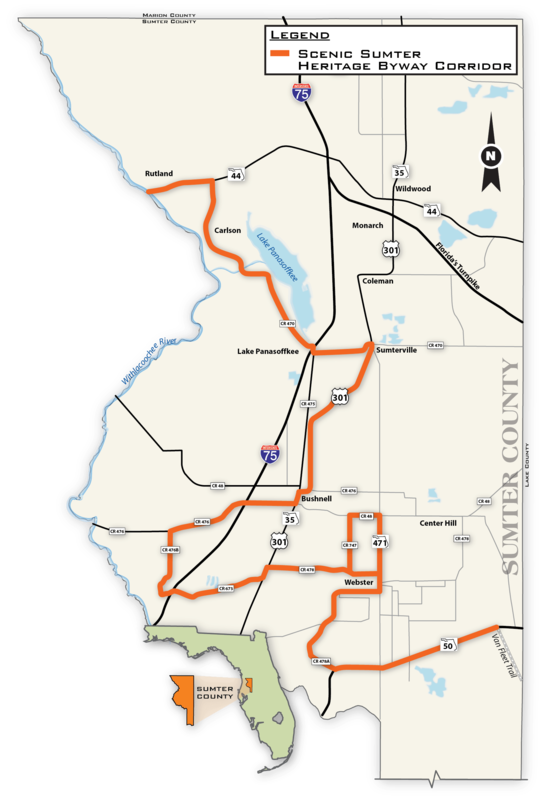 Located in the center of the state, south of Ocala and northwest of Orlando, Scenic Sumter Heritage Byway winds its way through several old Florida roadways and communities of Sumter County. Clearly off the beaten path from Florida’s surf and sand, the communities along this byway offer a friendliness that is special. The byway traverses pastoral farmlands, cattle ranches and horse farms with lush open fields along with quiet country towns, hardwood forests, a slow moving river lined with moss covered cypress trees and beautiful Lake Panasoffkee. Sumter County is located approximately one hour north of Tampa on Interstate 75. The Scenic Sumter Byway can be accessed from several I-75 interchanges (Exit 314 or 321). These are specific resources for this byway. See Associated Florida Resources for connections to organizations affecting all byways in Florida.